On Wednesday, April 10, the Chicago City Council voted to modernize their building code based on the International Codes (I-Codes), a move many years in the making. The International Code Council has been working closely with Chicago, our regional members, and other industry stakeholders to make this happen. Together we have helped the last major metropolitan city in the U.S. begin the process of transitioning to the I-Codes, which will advance building safety in Chicago, contribute to creating consistent codes across the state, and help the city and the region attract more business. The new code represents the first comprehensive revisions to the Chicago building code in 70 years and will make construction in Chicago more affordable by expanding options to design and build with a wider range of materials and technologies. The code update approved by the City Council moves Chicago closer to national standards in several significant areas, including building planning, fire and life safety, enclosures and materials, structural, small residential, and rehabilitation of existing buildings. And, this is not the end – the city is planning further modernizations based on the I-Codes over the next few years. 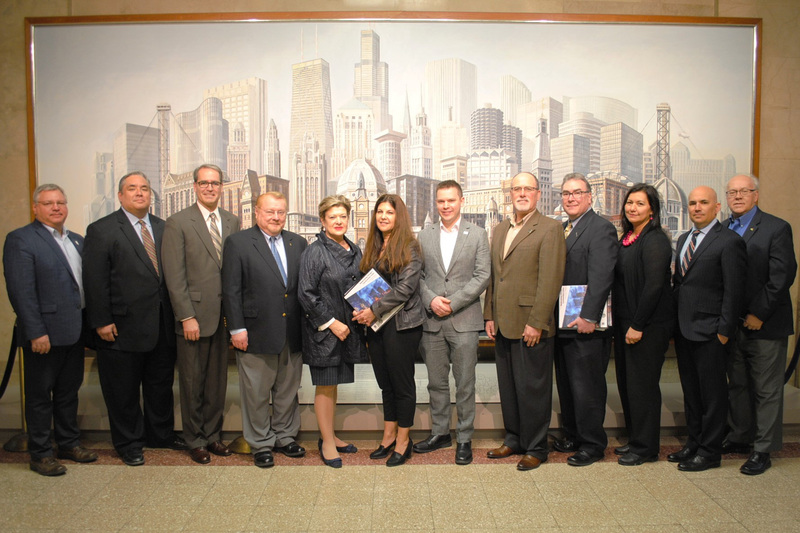 Code Council staff meet with Chicago Building Department Commissioner Judy Frydland and Deputy Commissioner Grant Ullrich (center) on April 9 in Chicago.